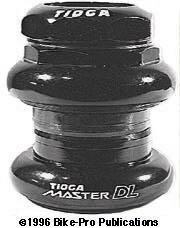 The Tioga Master DL headset is a well crafted bearing assembly. The head lock nut, the upper and lower bearing cup are all made of cast aluminum. These parts are anodized in Silver, or painted in high gloss Black. The bearing cups have cast black steel races, with ground bearing surfaces pressed into them. Each of the bearing retainers has twenty 9/64" steel balls in them. The fork and upper cone races are made of cast heat treated cro-moly steel, with the bearing surfaces ground after casting. There is nickel plated steel head key washer that fits into a recess as well as laying on the upper cup, which seals and helps keep the assembly tight. Between each of the cone races and the cup races, surrounding the bearings are plastic seals to keep contaminants out. There is also an internal rubber O-ring seal near the top of the head lock nut that seals the headset as the stem passes into it. Made in the standard 1" size, and the 1 1/8" oversize. Available in Black or Silver. The stack height of this headset is 33.5mm, the weight of a Black Master DL 1" headset is 101 grams. This headset uses all steel parts. The head lock nut, the upper and lower cup race are all painted black. The upper and lower cone races are made of steel and have a ground bearing surface. Each of the bearing retainers has sixteen 1/8" steel balls in them. This headset has plastic seals between the cone race and cup race that surround the bearing retainer to help keep contaminants out. The head lock nut has a rubber O-ring seal to stop debris from getting into the headset where the stem enters. The head key washer is chrome plated giving the headset a Silver accent. This is a solid, inexpensive replacement headset. Made in the standard 1" size or the 1 1/8" Avenger oversize. Available in Chrome Plated or Black. The weight of a 1 1/8" Avenger CR H-3 headset is 179.5 grams. Tioga licensed from Dia Compe, the privilege to make and sell an Ahead System compatible headset. The Alchemy AL-S has a slight weight advantage over the DL-S because it uses aluminum alloy in the making of two of the parts. 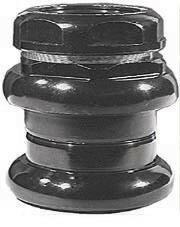 The cone race is made of Black colored steel, with the actual bearing surface ground to smoothness. The lower bearing cup is made of two Silver colored, steel pieces that have been pressed together. Though the bearing surface appears smooth, it has been given no special grinding or polishing. The upper cup is made of a single steel piece, stamped to make the cup shape, then colored Black. The upper cone race, like a few other headsets, is built into an enclosure that covers and surrounds the upper cup and its bearing. This upper cone race uses a polished steel element in the center at the bearing contact surface, and has pressed into it an aluminum alloy enclosure cup. The interior of the center steel cone race has tapered walls, narrowing in diameter at the bottom. Into this tapered area, a machined aluminum tube with a tapered compression ring fits. This compression ring, when compressed and held in place by the stem , is what holds the Aheadset styled headset in place between the frame and fork. To prevent contamination through the area between the fork steerer tube into the bearings, a durable rubber seal covers and encloses the top of the headset, over the compression ring and the upper cone race/cup. The Alchemy AL-S doesn't come with what Tioga refers to as the "anchor bolt set", which we and Dia-Compe have referred to as the adjusting bolt, top cap piece and Star Fangled Nut (or SFN). 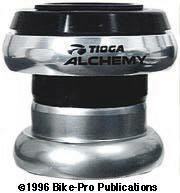 Tioga includes instead an expansion ring cir-clip to assist in holding the Alchemy headset in place, prior to tightening the stem. For bearings, twenty-two 4mm diameter steel ball bearings are housed in a steel retainer. A Black plastic skirt is used around the fork crown race to shield the lower assembly from contamination. Tioga is the originator of the 1 1/8" diameter size for headsets, arrived at as a compromise between the 1" and the oversized 1 1/4" diameter. The Alchemy AL-S is available in this 1 1/8" size. Made in Japan, it has an approximate stack height of 28mm, comes in Black or Silver and weighs 146 grams. The DL-S version of the Alchemy headset is much like the AL-S model. The fork crown race is made of steel with nice machine work and a well ground bearing surface cut and polished after the steel is given its Black color. The lower cup is made of Black aluminum alloy. It has a steel bearing race, well cut and polished, then pressed into the aluminum cup. A rubber gasket prevents contamination into the lower assembly. The upper cup is stamped of a single piece of steel, then has the bearing surface ground and polished. 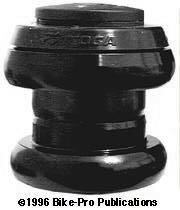 Like the AL-S model the upper cone race is incorporated into a cup which encloses the upper bearing assembly. The race itself is steel with a polished bearing surface, which is pressed into the larger enclosing cup made of aluminum. The center of the steel race is tapered, with a narrower diameter at the bottom. The same tapered aluminum compression ring, although now Black, is used inside this covering cup. To prevent contamination through the area between the fork steerer tube into the bearings, a durable rubber seal covers and encloses the top of the headset, over the compression ring and the upper cone race/cup. The DL-S model comes with the "anchor bolt set", which includes the cap piece, adjusting bolt, and SFN. The Alchemy DL-S is only available in the 1 1/8" diameter. Made in Japan, it has an approximate stack height of 28mm and has a total weight of 154.5 grams of which 24.5 grams is the anchor bolt set. Tioga also has another steel model made known as the ST-S. This headset is heavier than the other two. Though they all appeared in the Tioga product catalog at the same time this model arrived later in the US. It won't be reviewed until Edition 2 if there proves to be any rate of sale interest. It's available only in the 1 1/8" size painted Black.